Inflammatory bowel disease (IBD) increases the risk of developing colon cancer. This risk is higher in men compared to women, implicating a role for female hormones in the protection against this disease. Studies from our laboratory demonstrated that estradiol (E2) protects against inflammation-associated colon tumor formation when administered following chemical carcinogen and induction of chronic colitis. This study seeks to better understand the effect of E2 on acute colitis in the presence and absence of estrogen receptor β (ERβ). Inflammation was induced by 2,4,6-trinitrobenzenesulfonic acid in wild-type (WT) and ERβ knockout (ERβKO) mice implanted with a control or E2-containing pellet and killed 5 days later. Inflammation and injury were scored by a pathologist. Apoptosis and proliferation were assessed by immunohistochemistry. Cytokines were measured by multiplex analysis. E2 treatment reduced inflammation in the middle colon in WT mice and the distal colon in ERβKO mice compared to control mice. WT mice had reduced IL-6, IL-12, IL-17, GM-CSF, IFN-γ, MCP-1, MIP-1α, and TNF-α, and ERβKO had reduced IL-6 and IFN-γ expression in response to E2. Injury scores were lower in E2-treated ERβKO mice compared to control ERβKO mice. ERβKO mice had increased proliferation in the basal third of crypts in the distal colon and decreased apoptosis in the proximal colon. 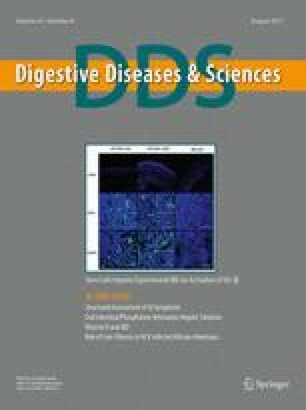 These data suggest that E2 has differential protective effects against acute colitis in the presence or absence of ERβ and provide insight into how E2 may protect against IBD. Funding was provided by American Cancer Society (Grant No. RSG-11-179-01-TVE).